Hello judges! It is time for another update about what has happened in the Judge Program over the past few months, and what the Program Coordinators are working on. In early June, the Regional Coordinators, Program Coordinators, and a few Sphere leaders gathered in Richmond to discuss program policy, strategy and various projects. Topics included the level structure, the selection and evaluation of advanced roles, the L2 Tester and Team Lead Certifications, and the Exemplar program. This was the first time we had a conference with both Regional Coordinators and other program leaders present at the same time. It was a very interesting and productive two days! In August, we’ll organize a Question & Answer session. You will have a chance to submit questions about anything you like – if you have a question about something judge program related, or if you have always wanted to know how many sugars Riccardo takes in his coffee, this is your chance. More details will be announced later. New Grand Prix Head Judge class was announced: read the full announcement here. Congratulations to Florian Horn, John Brian McCarthy and all expiring GPHJs who have renewed. The Grand Prix Head Judge Lead role selection is open on the Level 3 forum. The next Program Coordinator application window is open. The Regional Coordinator selection/renewal will begin in the third week of August. The next Judge Conduct Committee Lead selection will take place in Q3/Q4, for a one year term. After that, the role will have a two year term. Goals of the Program Coordinators for the Spring-Summer period. As mentioned in the previous Status of the Program article, each PC has certain areas of focus. You can read about these here. The Player Investigations Committee reviews all disqualification reports submitted through the Disqualification reporting form. When disqualification reports were reported through the old Judge Center, judges were able to see the result of the investigation afterward. With our current tools, this wasn’t simple, but we are now sending out investigation results by e-mail. The feedback about these e-mails has been very positive. If you report a DQ in July, the case will be reviewed during August, and you can expect to receive the results e-mail sometime in the first half of September. The Player Investigations Committee members are selected for a 12-month term. The previous term ended in June, and the new committee began its work on July 1st. While membership in the committee is not secret, we do not publish the names of committee members. After the big renovation with the Dominaria rules update, translators focused or updating the L1 and L1 Practice exams, and finishing the L2 and L2 Practice exams. At the moment, most languages have enough content for 2 or more completely different L1 or L1P exams, and reaching the same point for L2 and L2P exams. To fully use the translators work, just remember when creating an exam for yourself or someone else that Apps will create the exam with the pool of questions available for the language you’re actually using Apps! For example, if you have Apps in Spanish when you create the exam, it will use questions with Spanish translation, if possible (considering also the questions already seen by the candidate). Once the exam is created, the candidate can switch between languages (keeping the same questions, obviously! ), and will use English when there is no translation available. This is especially important when you create an exam for someone else, and they want to take the exam in a language other than English! If you want to know more about the translation of exam or other translations in the program, you can contact Juan Del Compare, who will put you in contact with the leaders of different projects and languages. Hello from the Levels Sphere! We’re aware there have been lots of rumors recently and we would like to use this publication to provide trustworthy information. In the recent months, we have been evaluating several different possibilities and options. Analyzing a possibility is not the same as implementing it, that’s why we prefer to keep confidential the options we analyze and go public only with stuff that has passed a preliminary analysis. Changes on the Team Leader Certification, it’s going to be replaced with the Team Leader Training Position (TLTP). All the information can be found here. Changes to Level 1 and feedback about the levels structure in general, have been collected through this survey. Changes to Level 2, none until we decide about Level 1. Changes to Level 3, nothing significant other than the inclusion of the TLTP in the certification process and an analysis of the L3 qualities in the near future. This is all for now from the Levels Sphere, we’ll keep you updated in every Status of the Judge Program article. This season we would like to highlight a project we have already mentioned in this article: the TLTP project. Project leader Dustin de Leeuw and his team have worked very hard to design this certification. Congratulations to the project team! We would also call out the excellent JudgeApps update bulletins from the JudgeApps development team. In these bulletins, you can find information about recent changes and bugfixes that the team has worked on. No matter how much time you spend on this site, you may find something useful in these articles! Read the latest bulletin here. There are many other judges contributing to different aspects of the program. We would like to highlight a few people doing awesome in their projects. We know there are many, many, many more judges going above and beyond in their volunteer contributions to projects, and we will be featuring more judges in the future issues of the Status of the Judge Program articles. Jeff Higgins for his continuous and high-quality activity on the JudgeApps forums. Amanda Coots for the Planar Bridge project. Eric Dustin Brown for leading the Feedback Loop project. Mark Brown for his support to chat.magicjudges.org (Judge IRC). Klaus Lassacher for organizing the Level 2+ conference in Prague. Zie Aun Tan for the years-long efforts in the Judge Tokens project. Federico Verdini for bringing the Planar Bridge project in Europe. Meghan Linscott for the Collected Company project. Kevin Desprez for his policy articles on the “Whats Up Docs” blog. 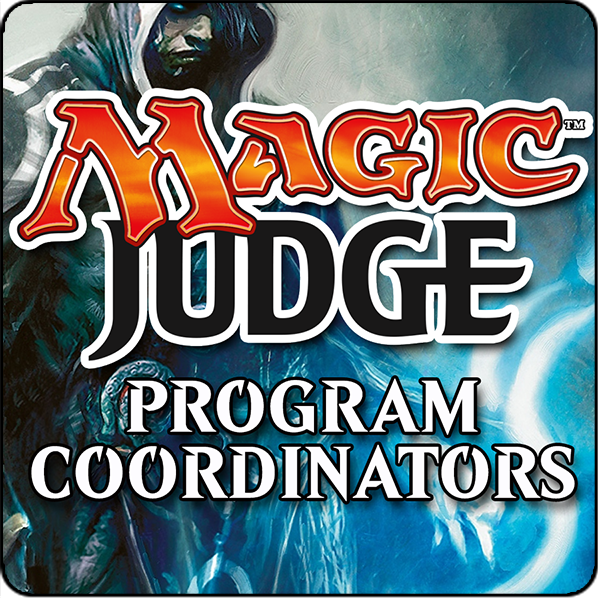 Miquel Angel Moya for creating judge guides for each prerelease. Ricardo Leite for his Portuguese translations of exams on JudgeApps.